Hey all. Any updates on volumes 4+? 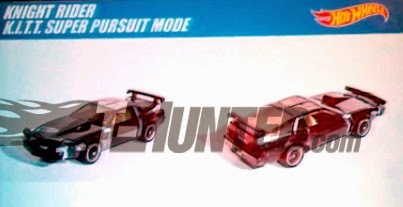 Re: Hot Wheels Retro Entertainment KITT Super Pursuit Mode.. I saw this last week. Looks really sweet. Arriving in stores shortly!!! I hope a 1:18 version will follow!!! Any word on the release yet? Seems to be taking it's time to hit retailers. Any news on the release date yet? Topic: Does Anyone have flaws about the Elite KITT 1/18? Re: Does Anyone have flaws about the Elite KITT 1/18? Topic: (non-car) Are there scanners that run on batteries? Re: (non-car) Are there scanners that run on batteries? Too bad they don't make a strip you can use anywhere! (non-car) Are there scanners that run on batteries? This will go nicely with my Hallmark Ecto-1, '66 Batmobile and Delorean Time Machine ornaments! Anyone know a reputable place to find it online? What some in the Hot Wheels community would also call valuable. Too bad it was opened. 1:18 K.A.R.R. Coming Next from Hot Wheels Elite!!! MrSmith wrote: I have found two KITT's but no KARR yet. That's because it's not out yet. It's part of the second wave from the series that should be hitting retailers within the next few weeks or so. Topic: Great Idea - How about turning your GARAGE into the SEMI? Great Idea - How about turning your GARAGE into the SEMI? You can tell both of these from online photos?? Or do you actually have one in hand? Is it me or do the rims look too small? The sizing on the Ertl/Aoshima model seem to have gotten it closer.